To Our Venerable Brethren, Patriarchs, Primates, Archbishops, Bishops and other local Ordinaries Enjoying Peace and Communion with the Holy See. 2. It is not surprising that such discord and error should always have existed outside the fold of Christ. For though, absolutely speaking, human reason by its own natural force and light can arrive at a true and certain knowledge of the one personal God, Who by His providence watches over and governs the world, and also the natural law, which the Creator has written in our hearts, still there are not a few obstacles to prevent reason from making efficient and fruitful use of its natural ability. The truths that have to do with God and the relations between God and men, completely surpass the sensible order and demand self-surrender and self-abnegation in order to be put into practice and to influence practical life. Now the human intellect, in gaining the knowledge of such truths is hampered both by the activity of the senses and the imagination, and by evil passions arising from original sin. Hence men easily persuade themselves in such matters that what they do not wish to believe is false or at least doubtful. 4. Furthermore the human intelligence sometimes experiences difficulties in forming a judgment about the credibility of the Catholic faith, notwithstanding the many wonderful external signs God has given, which are sufficient to prove with certitude by the natural light of reason alone the divine origin of the Christian religion. For man can, whether from prejudice or passion or bad faith, refuse and resist not only the evidence of the external proofs that are available, but also the impulses of actual grace. 5. If anyone examines the state of affairs outside the Christian fold, he will easily discover the principal trends that not a few learned men are following. Some imprudently and indiscreetly hold that evolution, which has not been fully proved even in the domain of natural sciences, explains the origin of all this, and audaciously support the monistic and pantheistic opinion that the world is in continual evolution. Communists gladly subscribed to this opinion so that, when the souls of men have been deprived of every idea of a personal God, they may the more efficaciously defend and propagate their dialectical materialism. 6. Such fictitious tenets of evolution which repudiate all that is absolute, firm and immutable, have paved the way for the new erroneous philosophy which, rivaling idealism, immanentism and pragmatism, has assumed the name of existentialism, since it concerns itself only with existence of individual things and neglects all consideration of their immutable essences. 7. There is also a certain historicism, which attributing value only to the events of man's life, overthrows the foundation of all truth and absolute law both on the level of philosophical speculations and especially to Christian dogmas. 8. In all this confusion of opinion it is consolation to Us to see former adherents of rationalism today frequently desiring to return to the fountain of divinely communicated truth, and to acknowledge and profess the word of God as contained in Sacred Scripture as the foundation of religious teaching. But at the same time it is a matter of regret that not a few of these, the more firmly they accept the word of God, so much the more do they diminish the value of human reason, and the more they exalt the authority of God the Revealer, the more severely do they spurn the teaching office of the Church, which has been instituted by Christ, Our Lord, to preserve and interpret Divine revelation. This attitude is not only plainly at variance with Holy Scripture, but is shown to be false by experience also. For often those who disagree with the true Church complain openly of their disagreement in matters of dogma and thus unwillingly bear witness to the necessity of a living Teaching Authority. 9. Now Catholic theologians and philosophers, whose grave duty it is to defend natural and supernatural truth and instill it in the hearts of men, cannot afford to ignore or neglect these more or less erroneous opinions. Rather they must come to understand these same theories well, both because diseases are not properly treated unless they are rightly diagnosed, and because sometimes even in these false theories a certain amount of truth is contained, and, finally because these theories provoke more subtle discussion and evaluation of philosophical and theological truths. 10. If philosophers and theologians strive only to derive such profit from the careful examination of these doctrines, there would be no reason for any intervention by the Teaching Authority of the Church. However, although We know that Catholic teachers generally avoid these errors, it is apparent, however, that some today, as in apostolic times, desirous of novelty, and fearing to be considered ignorant of recent scientific findings try to withdraw themselves from the sacred Teaching Authority and are accordingly in danger of gradually departing from revealed truth and of drawing others along with them into error. 11. Another danger is perceived which is all the more serious because it is more concealed beneath the mask of virtue. There are many who, deploring disagreement among men and intellectual confusion, through an imprudent zeal for souls, are urged by a great and ardent desire to do away with the barrier that divides good and honest men; these advocate an "eirenism" according to which, by setting aside the questions which divide men, they aim not only at joining forces to repel the attacks of atheism, but also at reconciling things opposed to one another in the field of dogma. And as in former times some questioned whether the traditional apologetics of the Church did not constitute an obstacle rather than a help to the winning of souls for Christ, so today some are presumptive enough to question seriously whether theology and theological methods, such as with the approval of ecclesiastical authority are found in our schools, should not only be perfected, but also completely reformed, in order to promote the more efficacious propagation of the kingdom of Christ everywhere throughout the world among men of every culture and religious opinion. 12. Now if these only aimed at adapting ecclesiastical teaching and methods to modern conditions and requirements, through the introduction of some new explanations, there would be scarcely any reason for alarm. But some through enthusiasm for an imprudent "eirenism" seem to consider as an obstacle to the restoration of fraternal union, things founded on the laws and principles given by Christ and likewise on institutions founded by Him, or which are the defense and support of the integrity of the faith, and the removal of which would bring about the union of all, but only to their destruction. 13. These new opinions, whether they originate from a reprehensible desire of novelty or from a laudable motive, are not always advanced in the same degree, with equal clarity nor in the same terms, nor always with unanimous agreement of their authors. Theories that today are put forward rather covertly by some, not without cautions and distinctions, tomorrow are openly and without moderation proclaimed by others more audacious, causing scandal to many, especially among the young clergy and to the detriment of ecclesiastical authority. Though they are usually more cautious in their published works, they express themselves more openly in their writings intended for private circulation and in conferences and lectures. Moreover, these opinions are disseminated not only among members of the clergy and in seminaries and religious institutions, but also among the laity, and especially among those who are engaged in teaching youth. 15. Moreover they assert that when Catholic doctrine has been reduced to this condition, a way will be found to satisfy modern needs, that will permit of dogma being expressed also by the concepts of modern philosophy, whether of immanentism or idealism or existentialism or any other system. Some more audacious affirm that this can and must be done, because they hold that the mysteries of faith are never expressed by truly adequate concepts but only by approximate and ever changeable notions, in which the truth is to some extent expressed, but is necessarily distorted. Wherefore they do not consider it absurd, but altogether necessary, that theology should substitute new concepts in place of the old ones in keeping with the various philosophies which in the course of time it uses as its instruments, so that it should give human expression to divine truths in various ways which are even somewhat opposed, but still equivalent, as they say. They add that the history of dogmas consists in the reporting of the various forms in which revealed truth has been clothed, forms that have succeeded one another in accordance with the different teachings and opinions that have arisen over the course of the centuries. 16. It is evident from what We have already said, that such tentatives not only lead to what they call dogmatic relativism, but that they actually contain it. The contempt of doctrine commonly taught and of the terms in which it is expressed strongly favor it. Everyone is aware that the terminology employed in the schools and even that used by the Teaching Authority of the Church itself is capable of being perfected and polished; and we know also that the Church itself has not always used the same terms in the same way. It is also manifest that the Church cannot be bound to every system of philosophy that has existed for a short space of time. Nevertheless, the things that have been composed through common effort by Catholic teachers over the course of the centuries to bring about some understanding of dogma are certainly not based on any such weak foundation. These things are based on principles and notions deduced from a true knowledge of created things. In the process of deducing, this knowledge, like a star, gave enlightenment to the human mind through the Church. Hence it is not astonishing that some of these notions have not only been used by the Oecumenical Councils, but even sanctioned by them, so that it is wrong to depart from them. 17. Hence to neglect, or to reject, or to devalue so many and such great resources which have been conceived, expressed and perfected so often by the age-old work of men endowed with no common talent and holiness, working under the vigilant supervision of the holy magisterium and with the light and leadership of the Holy Ghost in order to state the truths of the faith ever more accurately, to do this so that these things may be replaced by conjectural notions and by some formless and unstable tenets of a new philosophy, tenets which, like the flowers of the field, are in existence today and die tomorrow; this is supreme imprudence and something that would make dogma itself a reed shaken by the wind. The contempt for terms and notions habitually used by scholastic theologians leads of itself to the weakening of what they call speculative theology, a discipline which these men consider devoid of true certitude because it is based on theological reasoning. 18. Unfortunately these advocates of novelty easily pass from despising scholastic theology to the neglect of and even contempt for the Teaching Authority of the Church itself, which gives such authoritative approval to scholastic theology. This Teaching Authority is represented by them as a hindrance to progress and an obstacle in the way of science. Some non Catholics consider it as an unjust restraint preventing some more qualified theologians from reforming their subject. And although this sacred Office of Teacher in matters of faith and morals must be the proximate and universal criterion of truth for all theologians, since to it has been entrusted by Christ Our Lord the whole deposit of faith -- Sacred Scripture and Divine Tradition -- to be preserved, guarded and interpreted, still the duty that is incumbent on the faithful to flee also those errors which more or less approach heresy, and accordingly "to keep also the constitutions and decrees by which such evil opinions are proscribed and forbidden by the Holy See,"  is sometimes as little known as if it did not exist. What is expounded in the Encyclical Letters of the Roman Pontiffs concerning the nature and constitution of the Church, is deliberately and habitually neglected by some with the idea of giving force to a certain vague notion which they profess to have found in the ancient Fathers, especially the Greeks. The Popes, they assert, do not wish to pass judgment on what is a matter of dispute among theologians, so recourse must be had to the early sources, and the recent constitutions and decrees of the Teaching Church must be explained from the writings of the ancients. 19. Although these things seem well said, still they are not free from error. It is true that Popes generally leave theologians free in those matters which are disputed in various ways by men of very high authority in this field; but history teaches that many matters that formerly were open to discussion, no longer now admit of discussion. 20. Nor must it be thought that what is expounded in Encyclical Letters does not of itself demand consent, since in writing such Letters the Popes do not exercise the supreme power of their Teaching Authority. For these matters are taught with the ordinary teaching authority, of which it is true to say: "He who heareth you, heareth me";  and generally what is expounded and inculcated in Encyclical Letters already for other reasons appertains to Catholic doctrine. But if the Supreme Pontiffs in their official documents purposely pass judgment on a matter up to that time under dispute, it is obvious that that matter, according to the mind and will of the same Pontiffs, cannot be any longer considered a question open to discussion among theologians. 21. It is also true that theologians must always return to the sources of divine revelation: for it belongs to them to point out how the doctrine of the living Teaching Authority is to be found either explicitly or implicitly in the Scriptures and in Tradition. Besides, each source of Divinely revealed doctrine contains so many rich treasures of truth, that they can really never be exhausted. Hence it is that theology through the study of its sacred sources remains ever fresh; on the other hand, speculation which neglects a deeper search into the deposit of faith, proves sterile, as we know from experience. But for this reason even positive theology cannot be on a par with merely historical science. For, together with the sources of positive theology God has given to His Church a living Teaching Authority to elucidate and explain what is contained in the deposit of faith only obscurely and implicitly. This deposit of faith our Divine Redeemer has given for authentic interpretation not to each of the faithful, not even to theologians, but only to the Teaching Authority of the Church. But if the Church does exercise this function of teaching, as she often has through the centuries, either in the ordinary or extraordinary way, it is clear how false is a procedure which would attempt to explain what is clear by means of what is obscure. Indeed the very opposite procedure must be used. Hence Our Predecessor of immortal memory, Pius IX, teaching that the most noble office of theology is to show how a doctrine defined by the Church is contained in the sources of revelation, added these words, and with very good reason: "in that sense in which it has been defined by the Church." 22. To return, however, to the new opinions mentioned above, a number of things are proposed or suggested by some even against the Divine authorship of Sacred Scripture. For some go so far as to pervert the sense of the Vatican Council's definition that God is the author of Holy Scripture, and they put forward again the opinion, already often condemned, which asserts that immunity from error extends only to those parts of the Bible that treat of God or of moral and religious matters. They even wrongly speak of a human sense of the Scriptures, beneath which a Divine sense, which they say is the only infallible meaning, lies hidden. In interpreting Scripture, they will take no account of the analogy of faith and the Tradition of the Church. Thus they judge the doctrine of the Fathers and of the Teaching Church by the norm of Holy Scripture, interpreted by the purely human reason of exegetes, instead of explaining Holy Scripture according to the mind of the Church which Christ Our Lord has appointed guardian and interpreter of the whole deposit of Divinely revealed truth. 23. Further, according to their fictitious opinions, the literal sense of Holy Scripture and its explanation, carefully worked out under the Church's vigilance by so many great exegetes, should yield now to a new exegesis, which they are pleased to call symbolic or spiritual. By means of this new exegesis the Old Testament, which today in the Church is a sealed book, would finally be thrown open to all the faithful. By this method, they say, all difficulties vanish, difficulties which hinder only those who adhere to the literal meaning of the Scriptures. 24. 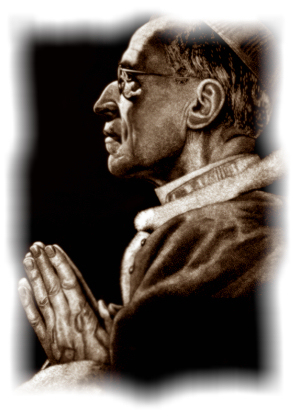 Everyone sees how foreign all this is to the principles and norms of interpretation rightly fixed by our predecessors of happy memory, Leo XIII in his Encyclical "Providentissimus," and Benedict XV in the Encyclical "Spiritus Paraclitus," as also by Ourselves in the Encyclical "Divino Affflante Spiritu." 26. Some also question whether Angels are personal beings, and whether matter and spirit differ essentially. Others destroy the gratuity of the supernatural order, since God, they say, cannot create intellectual beings without ordering and calling them to the Beatific Vision. Nor is this all. Disregarding the Council of Trent, some pervert the very concept of Original Sin, along with the concept of sin in general as an offense against God, as well as the idea of satisfaction performed for us by Christ. Some even say that the doctrine of transubstantiation, based on an antiquated philosophic notion of substance, should be so modified that the real presence of Christ in the Holy Eucharist be reduced to a kind of symbolism, whereby the consecrated species would be merely efficacious signs of the spiritual presence of Christ and of His intimate union with the faithful members of His Mystical Body. 27. Some say they are not bound by the doctrine, explained in Our Encyclical Letter of a few years ago, and based on the sources of revelation, which teaches that the Mystical Body of Christ and the Roman Catholic Church are one and the same thing. Some reduce to a meaningless formula the necessity of belonging to the true Church in order to gain eternal salvation. Others finally belittle the reasonable character of the credibility of Christian faith. 28. These and like errors, it is clear, have crept in among certain of Our sons who are deceived by imprudent zeal for souls or by false science. To them We are compelled with grief to repeat once again truths already well known, and to point out with solicitude clear errors and dangers of error. 29. It is well known how highly the Church regards human reason, for it falls to reason to demonstrate with certainty the existence of God, personal and one; to prove beyond doubt from Divine signs the very foundations of the Christian faith; to express properly the law which the Creator has imprinted in the hearts of men; and finally to attain to some notion, indeed a very fruitful notion, of mysteries. But reason can perform these functions safely and well, only when properly trained, that is, when imbued with that sound philosophy which has long been, as it were, a patrimony handed down by earlier Christian ages, and which moreover possesses an authority of even higher order, since the Teaching Authority of the Church, in the light of Divine revelation itself, has weighed its fundamental tenets, which have been elaborated and defined little by little by men of great genius. For this philosophy, acknowledged and accepted by the Church, safeguards the genuine validity of human knowledge, the unshakable metaphysical principles of sufficient reason, causality, and finality, and finally the mind's ability to attain certain and unchangeable truth. 30. Of course this philosophy deals with much that neither directly nor indirectly touches faith or morals, and which consequently the Church leaves to the free discussion of experts. But this does not hold for many other things, especially those principles and fundamental tenets to which We have just referred. However, even in these fundamental questions, we may clothe our philosophy in a more convenient and richer dress, make it more vigorous with a more effective terminology, divest it of certain scholastic aids found less useful, prudently enrich it with the fruits of progress of the human mind. But never may we overthrow it, or contaminate it with false principles, or regard it as a great, but obsolete, relic. For truth and its philosophic expression cannot change from day to day, least of all where there is question of self-evident principles of the human mind or of those propositions which are supported by the wisdom of the ages and by Divine revelation. Whatever new truth the sincere human mind is able to find, certainly cannot be opposed to truth already acquired, since God, the highest Truth, has created and guides the human intellect, not that it may daily oppose new truths to rightly established ones, but rather that, having eliminated errors which may have crept in, it may build truth upon truth in the same order and structure that exist in reality, the source of truth. Let no Christian therefore, whether philosopher or theologian, embrace eagerly and lightly whatever novelty happens to be thought up from day to day, but rather let him weigh it with painstaking care and a balanced judgment, lest he lose or corrupt the truth he already has, with grave danger and damage to his faith. 32. How deplorable it is then that this philosophy, received and honored by the Church, is scorned by some, who shamelessly call it outmoded in form and rationalistic, as they say, in its method of thought. They say that this philosophy upholds the erroneous notion that there can be a metaphysic that is absolutely true; whereas in fact, they say, reality, especially transcendent reality, cannot better be expressed than by disparate teachings, which mutually complete each other, although they are in a way mutually opposed. Our traditional philosophy, then, with its clear exposition and solution of questions, its accurate definition of terms, its clear-cut distinctions, can be, they concede, useful as a preparation for scholastic theology, a preparation quite in accord with medieval mentality; but this philosophy hardly offers a method of philosophizing suited to the needs of our modern culture. They allege, finally, that our perennial philosophy is only a philosophy of immutable essences, while the contemporary mind must look to the existence of things and to life, which is ever in flux. While scorning our philosophy, they extol other philosophies of all kinds, ancient and modern, oriental and occidental, by which they seem to imply that any kind of philosophy or theory, with a few additions and corrections if need be, can be reconciled with Catholic dogma. No Catholic can doubt how false this is, especially where there is question of those fictitious theories they call immanentism, or idealism, or materialism, whether historic or dialectic, or even existentialism, whether atheistic or simply the type that denies the validity of the reason in the field of metaphysics. 33. Finally, they reproach this philosophy taught in our schools for regarding only the intellect in the process of cognition, while neglecting the function of the will and the emotions. This is simply not true. Never has Christian philosophy denied the usefulness and efficacy of good dispositions of soul for perceiving and embracing moral and religious truths. In fact, it has always taught that the lack of these dispositions of good will can be the reason why the intellect, influenced by the passions and evil inclinations, can be so obscured that it cannot see clearly. Indeed St. Thomas holds that the intellect can in some way perceive higher goods of the moral order, whether natural or supernatural, inasmuch as it experiences a certain "connaturality" with these goods, whether this "connaturality" be purely natural, or the result of grace;  and it is clear how much even this somewhat obscure perception can help the reason in its investigations. However it is one thing to admit the power of the dispositions of the will in helping reason to gain a more certain and firm knowledge of moral truths; it is quite another thing to say, as these innovators do, indiscriminately mingling cognition and act of will, that the appetitive and affective faculties have a certain power of understanding, and that man, since he cannot by using his reason decide with certainty what is true and is to be accepted, turns to his will, by which he freely chooses among opposite opinions. 34. It is not surprising that these new opinions endanger the two philosophical sciences which by their very nature are closely connected with the doctrine of faith, that is, theodicy and ethics; they hold that the function of these two sciences is not to prove with certitude anything about God or any other transcendental being, but rather to show that the truths which faith teaches about a personal God and about His precepts, are perfectly consistent with the necessities of life and are therefore to be accepted by all, in order to avoid despair and to attain eternal salvation. All these opinions and affirmations are openly contrary to the documents of Our Predecessors Leo XIII and Pius X, and cannot be reconciled with the decrees of the Vatican Council. It would indeed be unnecessary to deplore these aberrations from the truth, if all, even in the field of philosophy, directed their attention with the proper reverence to the Teaching Authority of the Church, which by Divine institution has the mission not only to guard and interpret the deposit of Divinely revealed truth, but also to keep watch over the philosophical sciences themselves, in order that Catholic dogmas may suffer no harm because of erroneous opinions. 35. It remains for Us now to speak about those questions which, although they pertain to the positive sciences, are nevertheless more or less connected with the truths of the Christian faith. In fact, not a few insistently demand that the Catholic religion takes these sciences into account as much as possible. This certainly would be praiseworthy in the case of clearly proved facts; but caution must be used when there is rather question of hypotheses, having some sort of scientific foundation, in which the doctrine contained in Sacred Scripture or in Tradition is involved. If such conjectural opinions are directly or indirectly opposed to the doctrine revealed by God, then the demand that they be recognized can in no way be admitted. 36. For these reasons the Teaching Authority of the Church does not forbid that, in conformity with the present state of human sciences and sacred theology, research and discussions, on the part of men experienced in both fields, take place with regard to the doctrine of evolution, in as far as it inquires into the origin of the human body as coming from pre-existent and living matter -- for the Catholic faith obliges us to hold that souls are immediately created by God. However this must be done in such a way that the reasons for both opinions, that is, those favorable and those unfavorable to evolution, be weighed and judged with the necessary seriousness, moderation and measure, and provided that all are prepared to submit to the judgment of the Church, to whom Christ has given the mission of interpreting authentically the Sacred Scriptures and of defending the dogmas of faithful. Some however rashly transgress this liberty of discussion, when they act as if the origin of the human body from preexisting and living matter were already completely certain and proved by the facts which have been discovered up to now and by reasoning on those facts, and as if there were nothing in the sources of Divine revelation which demands the greatest moderation and caution in this question. 38. Just as in the biological and anthropological sciences, so also in the historical sciences there are those who boldly transgress the limits and safeguards established by the Church. In a particular way must be deplored a certain too free interpretation of the historical books of the Old Testament. Those who favor this system, in order to defend their cause, wrongly refer to the Letter which was sent not long ago to the Archbishop of Paris by the Pontifical Commission on Biblical Studies. This Letter, in fact, clearly points out that the first eleven chapters of Genesis, although properly speaking not conforming to the historical method used by the best Greek and Latin writers or by competent authors of our time, do nevertheless pertain to history in a true sense, which however must be further studied and determined by exegetes; the same chapters, (the Letter points out), in simple and metaphorical language adapted to the mentality of a people but little cultured, both state the principal truths which are fundamental for our salvation, and also give a popular description of the origin of the human race and the chosen people. If, however, the ancient sacred writers have taken anything from popular narrations (and this may be conceded), it must never be forgotten that they did so with the help of Divine inspiration, through which they were rendered immune from any error in selecting and evaluating those documents. 40. Truly, we are aware that the majority of Catholic doctors, the fruit of whose studies is being gathered in universities, in seminaries and in the colleges of religious, are far removed from those errors which today, whether through a desire of novelty or through a certain immoderate zeal for the apostolate, are being spread either openly or covertly. But we know also that such new opinions can entice the incautious; and therefore we prefer to withstand the very beginnings rather than to administer the medicine after the disease has grown inveterate. 41. For this reason, after mature reflection and consideration before God, that We may not be wanting in Our sacred duty, We charge the Bishops and the Superiors General of Religious Orders, binding them most seriously in conscience, to take most diligent care that such opinions be not advanced in schools, in conferences or in writings of any kind, and that they be not taught in any manner whatsoever to the clergy or the faithful. 42. Let the teachers in ecclesiastical institutions be aware that they cannot with tranquil conscience exercise the office of teaching entrusted to them, unless in the instruction of their students they religiously accept and exactly observe the norms which We have ordained. That due reverence and submission which in their unceasing labor they must profess towards the Teaching Authority of the Church, let them instill also into the minds and hearts of their students. 43. Let them strive with every force and effort to further the progress of the sciences which they teach; but let them also be careful not to transgress the limits which We have established for the protection of the truth of Catholic faith and doctrine. With regard to new questions, which modern culture and progress have brought to the foreground, let them engage in most careful research, but with the necessary prudence and caution; finally, let them not think, indulging in a false "irenism," that the dissident and erring can happily be brought back to the bosom of the Church, if the whole truth found in the Church is not sincerely taught to all without corruption or diminution. 44. Relying on this hope, which will be increased by your pastoral care, as a pledge of celestial gifts and a sign of Our paternal benevolence, We impart with all Our heart to each and all of you, Venerable Brethren, and to your clergy and people the Apostolic Benediction. 45. Given at Rome, at St. Peter's, August 12, 1950, the twelfth year of Our Pontificate. 1. Conc. Varic. D.B., 1876, Cont. De Fide cath., cap. 2, De revelatione. 2. C.l.C., can. 1324; cfr. Conc. Vat., D.B., 1820, Cont. De Fide cath., cap. 4, De Fide et ratione, post canones. 4. Pius IX, Inter gravissimas, 28 oct., 1870, Acta, vol. 1, p. 260. 5. Cfr. Conc. Vat., Const. De Fide cath., cap. 1, De Deo rerum omnium creatore. 6. Cfr. Litt. Enc. Mystici Corporis Christi, A.A.S., vol. XXXV, p. 193 sq. 7. Cfr. Conc. Vat., D.B., 1796. 8. C.l.C. can. 1366, 2. 9. A.A.S., vol. XXXVIII, 1946, p. 387. 10. Cfr. S. Thom., Summa Theol., II-II, quaest. 1, art. 4 ad 3 et quaest. 45, art. 2, in c.
11. Cfr. Allocut Pont. to the members of the Academy of Science, November 30, 1941: A.A.S., Vol. XXXIII, p. 506. 12. Cfr. Rom., V, 12-19, Conc. Trid., sess, V, can. 1-4. 13. January 16, 1948: A.A.S., vol. XL, pp. 45-48.